In September 2008 I hiked in Rocky Mountain National Park as part of Hike for Discovery, which is now Team in Training. Both of these raise money for the Leukemia & Lymphoma Society. Spending a couple an extra day at Estes Park I headed up towards Bear Lake for the morning but when I realized I was in the clouds decided to change those plans and quickly headed up to Trail Ridge Road. 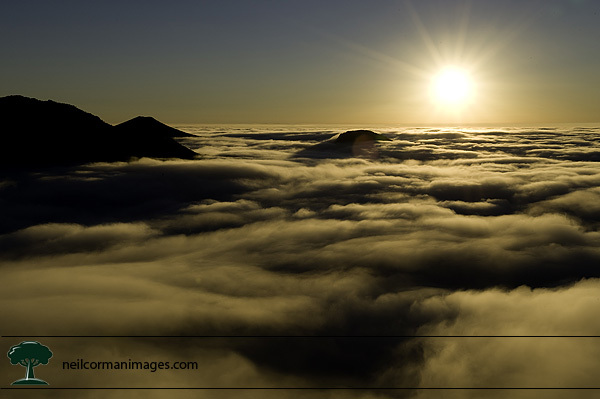 Just before Rainbow Curve, I broke out of the clouds and was treated with the following scene at sunrise. This image is available in the Rocky Mountain National Park gallery and is titled Rainbow Curve.